Five things that burn through your summer budget! Is your summer budget feeling the heat? It’s the season of parties, weddings, festivals, vacations, travel and household projects. While summer is great for the soul and loosens up schedules, summer expenditures add up quickly throughout the months. The surge in summer spending is influenced by so many factors which affect us in sneaky ways. Five tips can help you tackle overspending and splurges. Your behavior. It’s been proven! People spend more money on days when there’s more sunlight – on everything from summer food treats to the stock market to art sales. If you’re feeling tempted by a large purchase, wait a few days to evaluate the temptation. Summer hidden expenses. These include everything from unexpected parking charges to that extra cocktail to spending in preparation before vacation even starts! Create a summer budget and factor in “extras” for impromptu treats but stay on track. Lifestyle inflation. Sending your kids to upscale camps their friends go to, renting second vacations homes, hosting lavish celebrations for graduations, weddings, etc. Being honest about money is tricky but you have to communicate when you put yourself at risk. It’s not easy but necessary. Don’t be afraid to just say no – to yourself, your kids and your friends. Child support. Child support orders are created by reviewing the parents’ financial information in conjunction with the amount of time each parent spends with the child. For the non-custodial parent paying child support, the sudden onset of weeks-long visitation or parenting time could potentially result in a decrease in support obligations. However, practically speaking, courts are slow. Plan ahead if adjustments can be negotiated and agreed to for amending summer obligations. Do not assume you can do it unilaterally. Less structure for divorcing families. For many, summer reignites tensions when there is less structure and competing efforts to spend quality time with the kids. Try not to “out do” the other parent, with trips and activities for the kids that hurt your budget. Planning in advance and seeking mediation may help keep the peace. 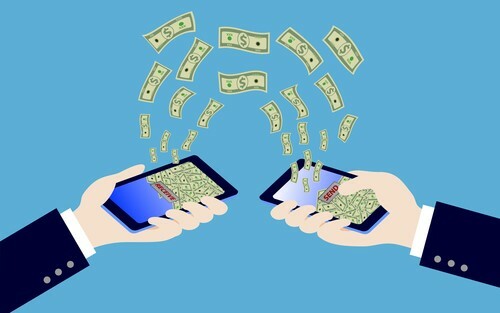 What’s the Difference Between Zelle, Venmo and Paypal? I thought this explanation was so clear so timely that I asked Judy if I could copy it for you. With full acknowledgment to her unique financial concierge services, here it is! Recently a friend asked me to "Venmo" her the money I owed her for theatre tickets. At first I thought it was some new slang that the Twittersphere came up with --- but my friend told me all about how it was a convenient way to transfer money between friends. I've used one of Venmo's competitors, Zelle, and I was curious about the difference between them, as well as good, old-fashioned PayPal. Can I Contribute to an IRA if I Don’t Have a Job? 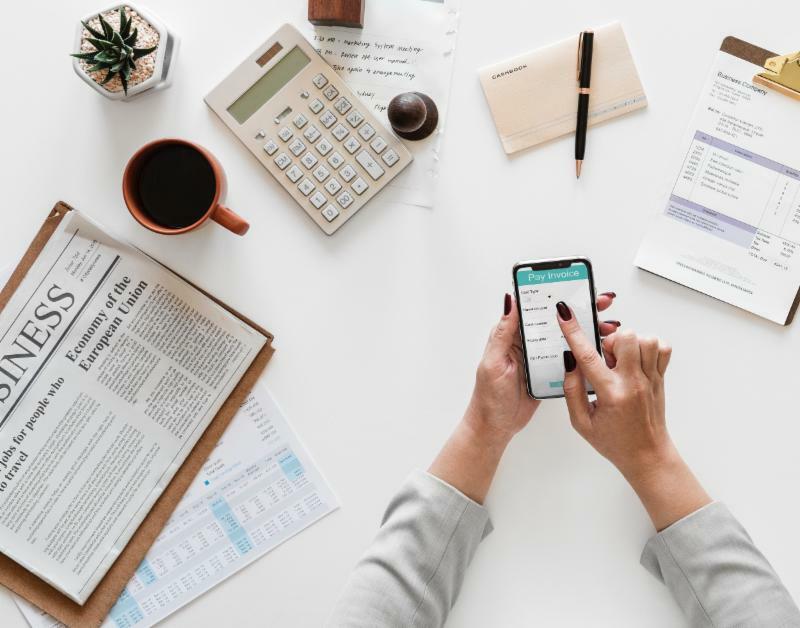 Most of us do not give it another thought and simply assume we can contribute to an IRA if we meet IRS income criteria. But what if your only source of income is alimony? Guess what – the new tax law changes may just eliminate your only means to save in a retirement account. An individual retirement arrangement (IRA) is a tax-favored personal savings arrangement, which allows you to set aside money for retirement. There are several different types of IRAs, including traditional IRAs and Roth IRAs. You can set up an IRA with a bank, insurance company, or other financial institution. What about if you receive alimony in 2019 that is nontaxable? The full report, available at www.nefe.org/early-warning-signs , documents new research funded by the National Endowment for Financial Education® (NEFE®) to identify very early financial skill declines in cognitively normal older adults funded by the National Institute of Aging of the National Institute of Health. 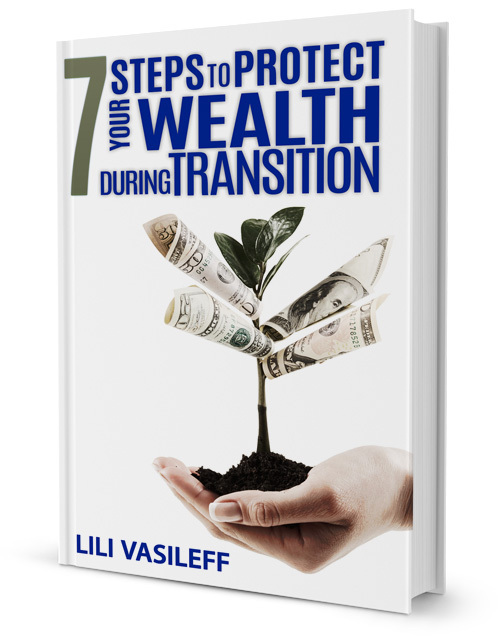 IT IS INEVITABLE that people will see a decline in their financial skills and decision-making ability as they age. No one is exempt: Everyone experiences normal cognitive aging in their later years, which in turn affects various financial skills. The degree of cognitive decline and its effect on specific financial skills varies by individual. In some cases, normal cognitive aging may be compounded by other disorders, such as Alzheimer’s disease, thereby accelerating cognitive decline and also financial skill decline. Thus, cognitive decline in aging could be as benign and gradual as commonplace forgetfulness, or as severe as full-blown dementia. The key is to be prepared for when — not if — this decline occurs. Findings include: • Education level is a key factor of resiliency in retaining financial skills. NEFE recommends adults in their 50s also take additional precautionary steps to ensure that their financial goals and wishes are understood and followed in the event their abilities to manage their own finances become diminished. 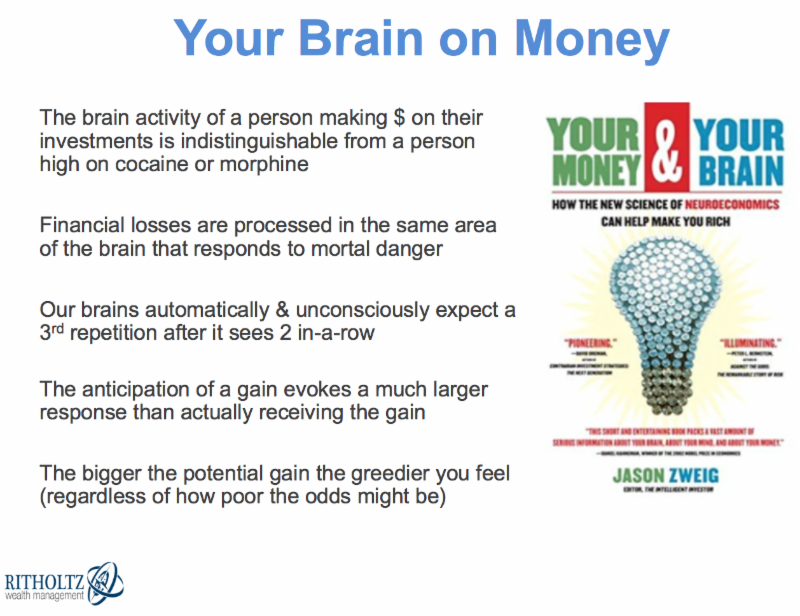 Your Money & Your Brain by Jason Zweig looks at neuroeconomics, which is research using brain activity, economics, and behavioral psychology to study how we make decisions. The main focal point is how the brain affects financial decisions but it’s obvious the material goes beyond money matters. It’s equal parts scary and impressive how much is going on behind the scenes in our brains unconsciously that we’re unaware of. There are two parts of your brain that make decisions — one is reflexive (instinctive and emotional) and one is conscious (more deliberate and logical). The reflexive system often responds before the conscious system realizes it was supposed to respond. The intuitive part of your brain is so laser focused on change it makes it difficult to focus on anything that remains constant. Money doesn’t buy happiness as far as the brain is concerned because the anticipation of a gain and then actually receiving said gain are processed differently in the brain. Getting exactly what you planned for doesn’t do much for excitement in your brain. Your brain consumes 20% of your oxygen and the calories you burn when you’re resting. So when you start to think heavily it can go into overdrive and wear you out. People begin to get confident in their predictive abilities when they think they’ve spotted a pattern even when they’re explicitly told events are random ahead of time. Your brain hates uncertainty so when it is confronted with difficult questions it tends to search out easier ones instead in terms it can understand. Our brains can re-live financial losses while we’re sleeping. The brain of a cocaine addict who is expecting to get a fix and someone looking to make money on their investments is virtually the same.